I love to impress my guests with my food, everyone does. Many seek out that best recipe for pumpkin pie or the most elegant side dish. Well seek no more friends, I bring you only the best. Firstly, your Thanksgiving soiree needs pizazz!. Don't do the ordinary fruit platter or crudités for your appetizers. Wow your guests with this Chocolate Brie en Croute at Kitchen Hacker. It's cheese, chocolate, and wine. What's not to like? If that isn't interesting enough, try the Poutine Rolls, filled with french fries and cheese curds, served with a gravy dipping sauce. A good appetizer in case you have an excess of gravy...and french fries and cheese curds. If you don't have those ingredients lying around, just make some Lardz, doughnut-hole sized lard balls, deep fried and topped with sugar. I have half a heart to try them. And I'd only have half a heart left after trying them. Now forget the same old yams with the marshmallow topping, dig into a Krispy Kreme Bread Pudding! A delightful, dare I say decadent, option for a side dish at your Thanksgiving feast. 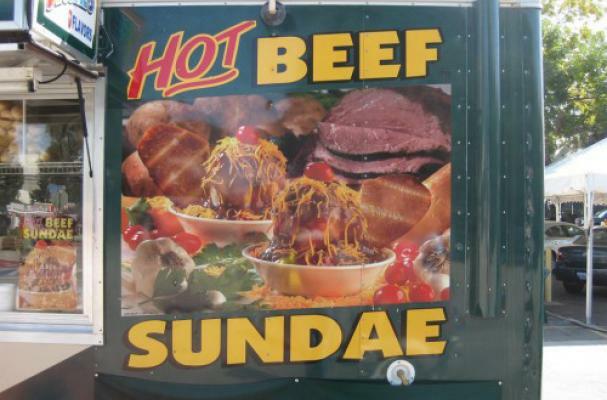 The Hot Beef Sundae is an excellent choice to impress the in-laws. Made of mashed potatoes, gravy, shredded cheese, and a cherry tomato. They'll be talking about it for years to come. For the main course I would have to recommend a Porkgasm or a Turbaconucken. The Porkgasm, found over at Porktopia, seems like a decent, even cute, alternative to the traditional turkey. And by cute I mean disturbing and nauseating. If you're not already grossed out, take a look at the Turbaconucken by NYC Food Guy. It's exactly as it sounds--an infamous Turducken, with bacon. Because bacon makes the world go 'round. But to top it all, for you Thanksgiving bird enthusiasts, whether it be turkey, duck, or chicken, behold...the 12 Bird True Love Roast. A real people pleaser. Now this you don't have to make, you can buy it from the people over at Heal Farm. It has 12 different kinds of bird, 8 different stuffings, takes two people to lift and will feed 125 people. Sold yet? Dessert is served! A Turkey Meat Cake, for those who really want to break away from the mold of Thanksgiving pies. Too much meat? Wash it all down with Tofurkey and Gravy flavored soda. I'd try it, would you? Forget the yams with the marshmallow topping, dig into the Krispy Kreme Bread Pudding! A delightful, dare I say decadent, option for a side dish at your Thanksgiving feast. This post was mentioned on Twitter by foodista: New blog post: The Most Disgusting Thanksgiving Dishes http://www.foodista.com/blog/2009/11/20/the-most-disgusting-thanksgiving-dishes/..